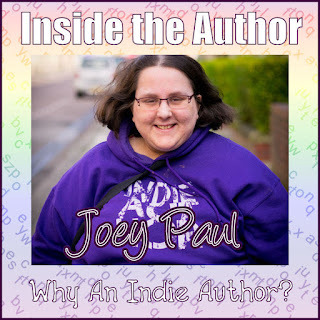 Bug Books: Joey Paul Online: Inside The Author: Why An Indie Author? After I finished BLACKOUT in 2002, I started to approach agents and publishers. I got rejection letter after rejection letter and after a while, I gave up. What was the point in writing all this if no one was ever going to read it? As some of you who follow my blog will know, it wasn't until late 2004/early 2005 that I was approached by the self publishing company AuthorHouse who were offering me the chance to publish BLACKOUT through them for a price. I don't regret that decision, it was the right one for me at the time and it pushed me into the writing world head first and I was determined that I wouldn't sink. About six months after BLACKOUT was released in August 2005, I was again approached with the possibility of becoming an indie author. It took me a long time to get to a point where I could make that decision and implement it and it wasn't until 2011 that BLACKOUT was released as an e-book on Amazon through an independent label, Bug Books. When my second and third book were released the following year, I found myself once again being flung head first into the indie author pool and this time, I had a lot more control. By control, I mean the ability to set my own prices, to choose release dates and to work with an editor whose opinion and work ethic I admired. I was also able to work alongside my best friend and carer, B, with her designing my book covers. She'd done the same with my first book before it was released, but this time I was able to pay both her and my editor a percentage of what I earned in royalties. Now that I am more established as an indie author, they both get a flat rate sum depending on the level of work they have to do. This is something I wasn't able to do when I was reliant on what is basically a vanity publishing house. They gave me a set choice of prices and although I chose the lowest one, it was still a huge amount to expect someone to pay for a paperback from an author they had never heard of before. It wasn't an easy start, and it wasn't any easier once I got started. Being an indie author is hard work. Not that working with a traditional publishing house is a walk in the park, but an indie author doesn't have as much back-up as those authors have. I am 100% responsible for a number of things. I have to promote myself, run my Facebook page, work out how much tax I have to pay and so on. It's not easy and it's not cheap. Due to the fact that Bug Books is my own indie label, I am on my own. Other indie authors go through independent publishers and that works for them as they are able to share some of the tasks out through the company. However, you'll find that even then, a lot of the promotion and every day admin tasks still fall on the author themselves. There is also the problem of the backlash from traditionally published authors, as well as the misconception readers may have that because your work is not published through the big six publishing houses then it must not be any good, or that you don't edit and just publish the first draft, which in my circle of author friends who are indie, is not true. I pay for an editor, but I also have beta readers and proof readers who help to double check that my work is as correct and to make sure that mistakes won't make it into the final draft. B works hard on my covers, and is redoing all the older ones at the moment to make them look that much better. Juggling all of that alongside being chronically ill, and also being a part time university student, is hard work. I have emails to reply to, and blog posts to write. I have to make sure that I get the rest I need so that I don't overdo it and get sick just when I can't afford to take time off. In the future, I plan to hire an assistant, but for now, it's just me, my editor, Antonia, my proof-reader, Natalie, and my cover artist, B. Having said all of that, I love being an indie author. I love working for myself and creating my stories. I don't like having to edit, but not everybody likes every aspect of their job. I became an indie author because I believed, and still do, that I had stories to tell and I wanted people to be able to read them. I write because it's something I love to do and being an indie author and not tied to a contract allows me to do that. It's hard work, but seeing a review from someone who brought, read and enjoyed my books means the world to me and I wouldn't stop doing it for anything.